Home > Events > What are the key trends for emerging technologies? Last week while most of us this side of the pond were at the electronica exhibition in Munich, approximately 3,500 attendees from 42 countries headed to the IDTechEx Show in Santa Clara, California, which featured 284 exhibiting organisations. Raghu Das, CEO, IDTechEx, explains. The event helps to bring together eight key technologies – 3D printing; electric vehicles; energy storage; graphene; IoT; printed electronics; sensors and wearables - with the organisations that seek to use them. The following were among some of the key technology highlights covered at this year’s event, as presented in the opening presentation by IDTechEx CEO Raghu Das. Key developments including the commercialisation of foldable displays, with Royole Corporation presenting on the first foldable smart phone coming to market in December 2018. JOLED covered the world’s first printed OLED display. 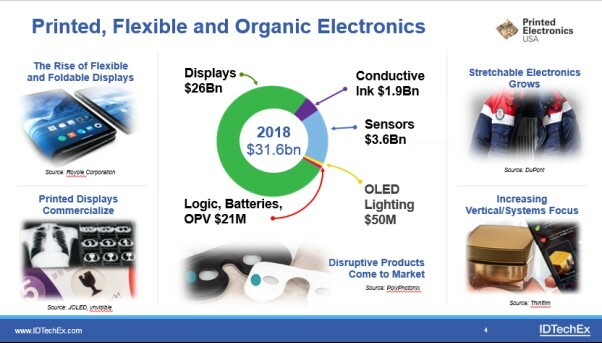 Many companies presented on their progress in printed electronics as they move from being a component provider to a systems/solution provider, filling that gap in the value chain. 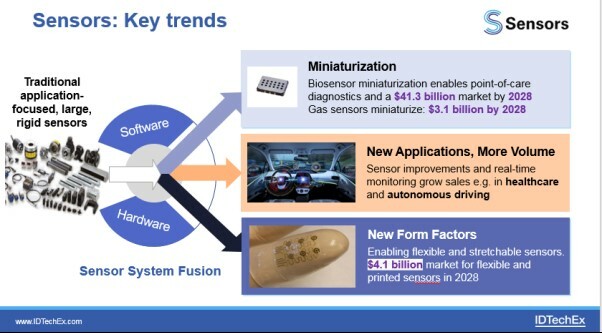 The event covered three key trends with sensors: miniaturisation; technology improvements that are driving volume growth in more applications and new form factors. 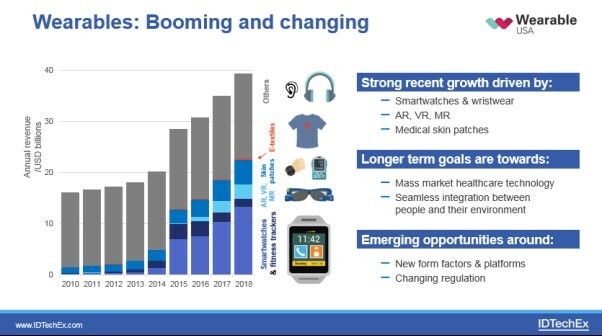 Over the last six years there has been tremendous growth in the wearable technology sector. For example, in 2013 smartwatches and fitness trackers were around $1bn in sales. In 2018, they are over $12bn. Electronic skin patches have grown to a $5bn industry with many in wearables focusing on mass market healthcare technologies, helped in part by changing regulations. 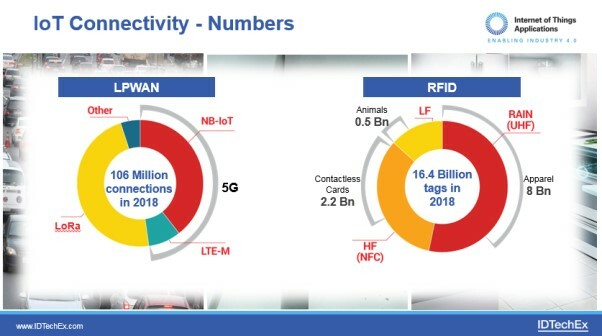 The event featured case studies across many IoT applications, in addition to appraising the different technology options – from Low Power Wide Area Networks (LPWAN) to RFID deployment, with the latest IDTechEx numbers shown below. 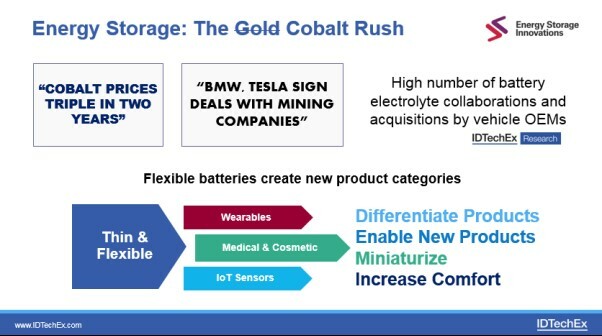 This all creates huge new opportunities: for materials (from thermal interface materials to structural electronics to light weighting); components (including sensors and connectivity); to complete new vehicle types such as electric shared passenger vehicles. Such topics were explored at the event. See the full range of IDTechEx electric vehicle research here. Many of the new capabilities highlighted at the event are enabled by advancements in materials. For example, new trends such as 5G is creating new opportunities for materials for EMI shielding due to the higher frequencies used. Stretchable conductive materials and substrates are part of a growing e-textile sector that will create a market worth over $2bn in 2028. In addition to many materials that were covered, the event explored graphene in detail. 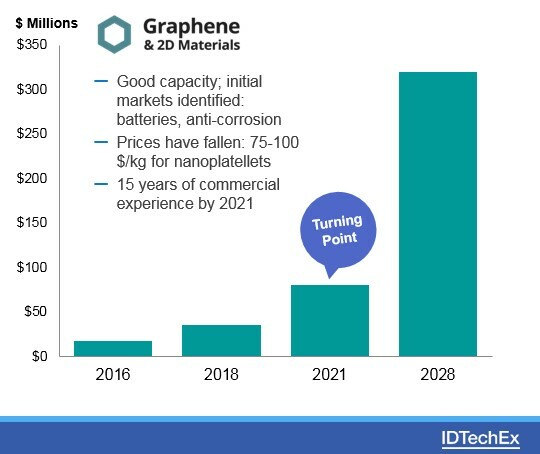 There is now good global capacity to make graphene and suppliers are focused on realistic, short term markets. Prices have fallen and all this is leading to strong commercial interest – IDTechEx expects strong take-off in sales around 2021, creating a market nearing $350 million for the material in 2028. 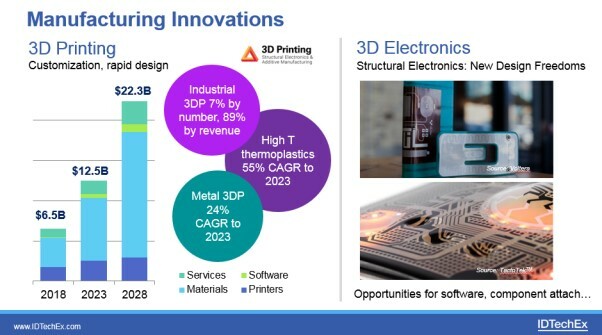 3D printed materials are a large part of the market value, showing strong growth – such as high temperature thermoplastics which are the fastest growing material type in the 3D printed polymer category at 55% CAGR to 2023. Then there are also other processes enabling 3D electronics - bringing vastly new design freedoms including light weighting, space saving and other benefits such as ability to customise designs more easily in some cases. These offer radical new opportunities for product designers.